Messenger 4 is all about simpler and easier-to-use messaging. Focusing on simplicity, we are bringing a easy to use interface with new fun features like color gradient background to personalize your conversations even more. Facebook Messenger on iOS testing hidden Dark Mode interface, here's how to enable itAs iOS 13 is rumored to add long-awaited system-wide Dark Mode, Facebook is seemingly testing a dark interface for its Messenger app. As spotted by a user on Reddit, there's a hidden way to enable Dark Mode in the Facebook Messenger app. Here's how to do it. 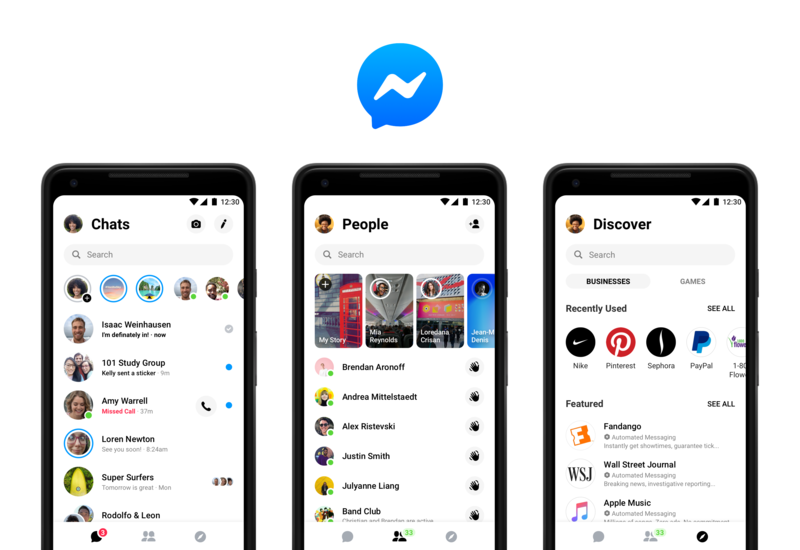 Facebook is now rolling out a dark mode to Messenger usersFacebook has been overhauling its Messenger app recently, slimming it down to focus more on chat, and promised that it would eventually roll out a dark mode for users. That mode is now rolling out, but there's a neat trick you need to do in order to activate it. Facebook is trying to make Messenger less of a messFacebook is trying to clean up Messenger. The company showed off a new, redesigned version of the app, which is starting to roll out to users now. The reason for the redesign is what many users have known for years: Messenger, in its current form, is a bloated confusing mess. Facebook Messenger Is Getting a Much-Needed OverhaulFacebook is looking to simplifying your chat sessions. The social network giant's Messenger 4, announced today (Oct. 23), will streamline the look of the chat app, with an eye toward making it easier to navigate your way through messaging. Facebook Cleans House With Messenger RedesignSpring cleaning started early at Facebook: The company unveiled a new version of its Messenger chat app Tuesday that cuts down on a lot of the clutter that had found its way into the app in recent years. The biggest change: The new Messenger version features just 3 tabs, as opposed to the previous 9 tabs. How Facebook's Messenger Got Its New Look in a New Jersey BasementOnly six social media apps in the world have a billion or more users, and four of them belong to Facebook. Tops is the eponymous flagship app, known as "Big Blue," followed by three apps all focused on messaging: Instagram, WhatsApp, and Messenger. Facebook Messenger was just completely redesignedFacebook has completely redesigned its Messenger app, taking away its old mass of features and aiming to make it more simple. The company has got rid of the nine tabs and variety of options that greeted users who opened up its chat app and has instead swapped them for just three tabs. Facebook launches simplified MessengerFacebook Messenger has been relaunched with a simpler interface, the company has announced. The announcement: Say Hello to the New Messenger: Introducing Messenger 4 By Stan Chudnovsky, VP of Messenger Starting today, we're rolling out a new, simplified version of Messenger: Messenger 4. Facebook is finally decluttering MessengerAt an event in Facebook's new San Francisco headquarters, the company admitted that Messenger had gotten bloated over the years. "It's not as simple as the app was at the beginning," said Stan Chudnovsky, the head of product for Facebook Messenger. "We knew it needed to be simple again." Facebook's Messenger makeover focuses on simplicityFacebook's messaging app is getting a new look and the tech firm wants to keep it simple. On Tuesday, the social media giant unveiled a new version of Messenger that the company said is easier for users to browse. Instead of nine tabs along the bottom, users will now only have three tabs -- chats, people and discover. Would you recommend Messenger 4 to a friend? Hey everyone, we are super happy to release this new version of Messenger today. It has been a lot of work and a great journey to simplify this app used by 1.3B people. @jmd you must feel quite the sense of responsibility when updating anything used by that many people! What were the leading factors when making decisions about the updates to make? @jmd Seriously hate how people were forced to download this app instead of just enhancing the functionality of the Facebook app's messaging system. Absolutely ridiculous splintering of a product for no reason. @jmd @youngbloodjoe I rather have 2 separate apps that run smoothly than one huge app, that will lag and have performance issues. @ems_hodge Primary user feedback. 7 out of 10 people told us simplicity is the top priority and we obviously agreed that this was a huge opportunity and an area where we could do way better. @youngbloodjoe Because some people want to use the powerful features of Messenger without a Facebook account. Nice to see Facebook do a refresh of Messenger. It's common for apps like this to build feature and UX debt. That said, I ultimately use chat apps my friends are on and as much as I love business fish, new features and cleaner UX won't change my adoption (although it might get me to come back to the app more often each day in ways I don't even recognize). I'm curious to hear peoples' thoughts on Messenger in general. Do you use it? Most people use multiple apps to communicate with different groups of people. What's your favorite messaging app today? @rrhoover Looks Great.. won’t use it: love the design but I don’t like the company any more. I guess that is what many people may feel like..
@jmd Haha - I do love dark mode for everything. Looking forward to using it! Hmm. From Skype's post Simplicity and familiarity—updates to the Skype user experience from August 31, 2018: "As Skype functionality has expanded, so too has its complexity. As with any feature rich product, maintaining simplicity while enhancing functionality is critical to usability. This past year we explored some design changes and heard from customers that we overcomplicated some of our core scenarios. Calling became harder to execute and Highlights didn’t resonate with a majority of users. We needed to take a step back and simplify! "Today, I want to share our focus on simplicity* to provide an overall better experience for you by making Skype faster to learn and easier to use. "Simplified navigation—We are refocusing on the fundamentals of why most people use Skype—to make a call (often with video) and/or send a message. "Our new navigation model removes redundant and underused features that create clutter—making it much easier to find the people you want to talk to and contact them in an instant. On mobile we are moving to three buttons at the bottom of the app—Chats, Calls, and Contacts..." ... From Messenger's announcement: "In a recent Messenger study, 7 out of 10 (71%) people told us simplicity is the top priority for them in a messaging app. Among people surveyed who are messaging more frequently, 62% say messaging makes them feel closer to their friends (2). We believe Messenger 4 delivers the closeness and authenticity that you’ve been asking for — through simplicity of design and powerful features that put the focus back on messaging and connecting. "Simple: Easier to Navigate "To make it easier to find the features you care about, the new Messenger will have three tabs instead of nine." @chrismessina May 1, 2018: https://www.theverge.com/2018/5/... “When you’re messaging, you really want a simple and fast experience,” Mark Zuckerberg said during the company’s F8 keynote. 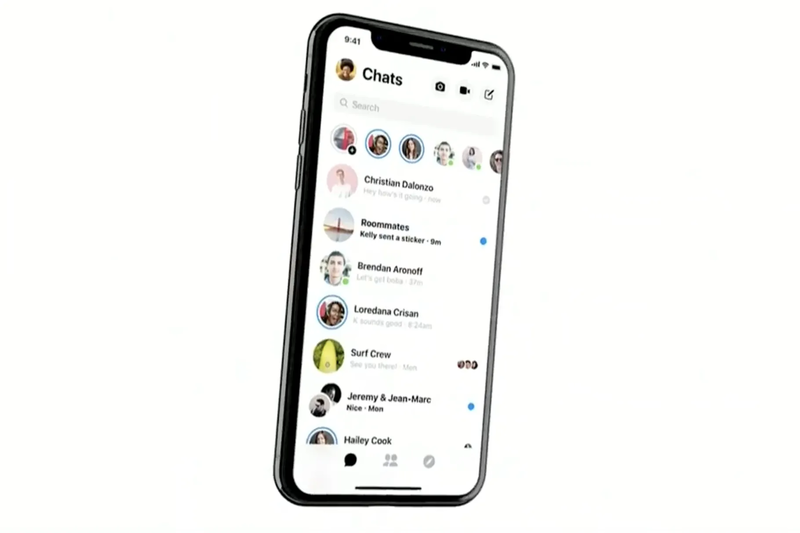 “We’re taking this moment to completely redesign Messenger to focus on these ideas.” Zuckerberg again reiterated the “clean” and “fast” nature of the revamped Messenger app before moving on in the keynote. After 7+ months of rigorous product development, usability testing, and experimentation, re-designing an app for 1.3+bn people, it turns out that messaging apps are more similar than they are different. @chrismessina You have an awesome mindset, Chris.